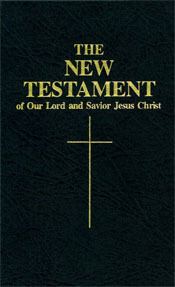 This edition of the New Testament is small enough (and sturdy enough) to hold up even when it's tucked into a crowded pocket or purse. As such, it's perfect to carry with you for those moments in line or in waiting rooms when you can take some time for a moment's consolation from the Word of God. A reprint of the reliable Confraternity edition published in 1941, the type in this pocket-size volume is large enough to read with ease,and features a convenient ribbon placemarker.